Blackberry Storm - Bug ? This one took about an hour on the phone with Verizon technical support. I had been using another cell phone to send a text message to the Blackberry. The message was received, the status light flashed red, but there was no audible alert. Of course since the phone had only come out yesterday - the tech. support person had not seen one yet. She read through her manual - which had a lot more pages than my manual - and had me try a few things. None of these things had any effect on my issue. Finally, I found a setting in the SMS alert menu that DID NOT AT ALL sound like it was related. I figured this was enough reason to try it! 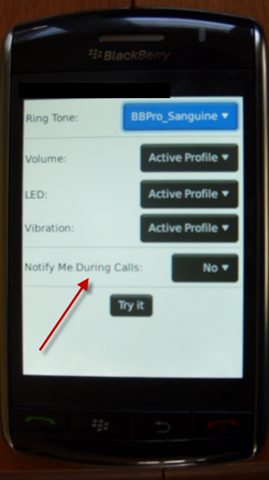 The setting I am talking about is - NOTIFY ME DURING CALLS. This setting seems to say that Yes means sound the alert if I am on a call and no means do not sound the alert if I am on a call. The way it worked for me is that when I am NOT ON A CALL - I only get an alert if this item is set to YES. If it is set to NO I get no alert when not on a call. I have to imagine that is going to be a large problem for Verizon Storm users. I hope that they are quick in coming out with a fix for this.